Folding panel / Partition Screen . 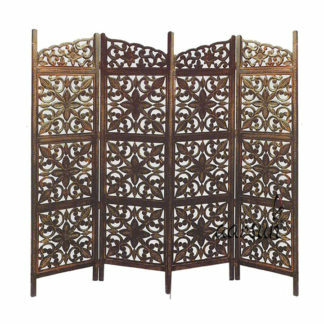 Aarsun Woods bring you this Handmade Folding Partition Screen made from Mango Wood & MDF with floral work that gives an elegant and traditional look (matte finish) to your living room. Consists of 4 Panels each of 72 inches Height and 80 inches approximately Width. This stylish partition separates the living room area from the rest of the house or can be used for separating Pooja Space from the rest of the house. A superb way of improvising your home decor and creating privacy in your living room and bedroom with the screen panel from Aarsun woods. Partition Screen is easy to clean and maintain. The elegantly designed divider is trendy with fabulous designs and made of Fine Mango wood & MDF(Medium Density Fiberboard). Add a classy feel to your living room. A number of designs available in fine Mango wood. Can be customized as per your requirement. Contact us in case you need any other size or design. * Please check our COD Policy for details. ** Free Shipping is available for Standard Surface Shipments. For Faster Delivery, contact us for details.